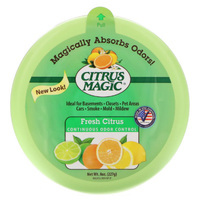 Citrus Magic Solid Air Freshener - Fresh Citrus Scent, 8 oz - Penn Herb Co. Ltd. Ideal for basements, closets, pet areas, cars, smoke, mold, mildew. Solid air freshener for pet areas, basements, auto/rvs, closets, laundry rooms, bathrooms, cars, smoke, mold, mildew. Peel off top label exposing air vents. Place all around the house in the areas you want to keep fresh and odor-free. Citrus Magic will absorb odors in 350 square ft. areas for 6-8 weeks. For increased effectiveness, place near circulating air source.